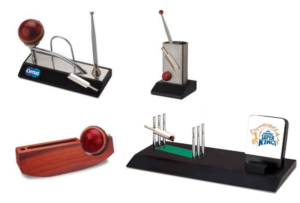 Sparket Corporate Gifts for pleasant surprises makes it easy for you to select the various sports related products and in this series, we are focusing on cricket the most popular game. Products are readily available made of various materials including wood in combination with metals with choice of both gold and silver polish with excellent branding space to ensure high visibility for your brand and company. 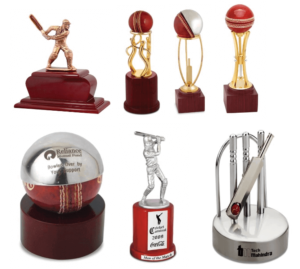 Please check below the images and select the various trophies or mementoes related with cricket tournaments. However, if you still need more varieties then please ask us for our latest additions. Depending on your quantities and overall budget we can customise the trophies or mementoes to make the internal cricket event more memorable. For executives you can pick table tops from the choices given with choice for daily utility items. Advantage is due to the high utility the gift is always in front of the eyes of your target audience. You have choice of visiting card slot or memos with pen or simply the cricket pitch with your prominent branding. You must connect with the vastly popular game of cricket and extract mileage due to high frequency of the various matches played round the year. 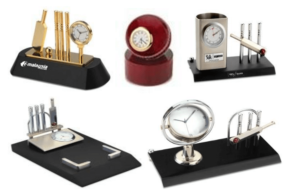 A table top utility gift associated with the game of cricket with clock will surely help you to capture the frenzy and strongly connect with the cricket audience. Apart from high utility of clock with space for pen or memos with prominent branding of your logo you can also select from the range given below or opt for complete customised design within your budget. You can even imprint your multicolour logo on the dial of the clock to ensure that every time someone looks at the clock to check the time even your brand is noticed subconsciously. All our clock movements are of Japanese make with warranty of 18 months. You can select the handy keyring with the choice of either ball, bat or both to make it easy for the people to carry it around. The cricket miniature ball is available in both red and gold colour. The key ring is also available in choice of silver or gold colour. 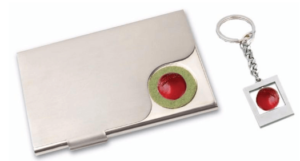 Giveaway gift at all cricket events with either a keyring alone or both a key ring along with a visiting card holder with your branding to not only connect with the sport but also to ensure mileage once the cricket season fever is over. Please write to us for more choice of gift sets for the game of cricket or for any other sports. We also have desk and table top range without connecting with sports or related with various other industries including tyre, home, aeroplanes etc. Please send me catalog for gifts related to cricket game only. We have women’s league here and I wanted to see some cricket related desk top gifts, photo frames, & all cricket related gifts . Pls send me catalog with price and shipping info.